Now don't allow the title of this book to put you off. Yes the 7-Point System was written for the CS3 version of Photoshop and there have been a number of major releases since. Despite this the basis of the "System" remains sound as do the techniques outlined in the book. If you have a later version of Photoshop than CS3 then you can still use the system in full and it will still produce the goods for you. 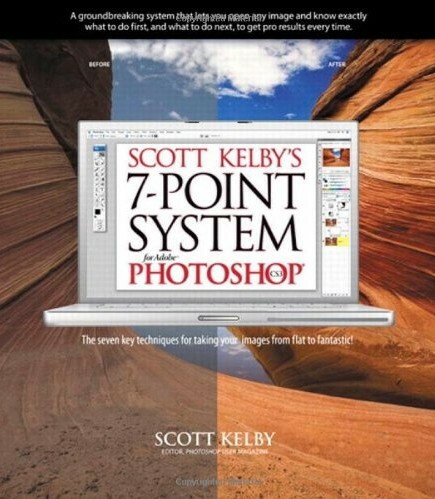 This is a very accessible book for those new to Photoshop and highly recommended. It works the reader through a number of chapters or lessons in how to apply the techniques of the 7-Point System including such things as painting with light. Whilst some of the material is very repetitive (needed to help the lessons sink in for those less experienced) there are some real nuggets in there. One word of warning is that you will need to put up with the authors humour – not always easy (sorry Scott).